Xbox 360 owners who are also fans of the BBC iPlayer are in for yet more disappointment, after it emerged the media platform won't be coming to Microsoft gaming hardware anytime soon. 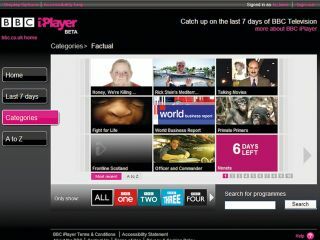 The iPlayer channel, which is already available to PS3 and Wii users, is hitting a brick wall with the Xbox because Microsoft apparently wants to put it behind a pay wall – something the BBC charter specifically prohibits for UK viewers. Speaking to the Telegraph, a BBC source explained: "Microsoft only wants to offer its users access to platforms it can charge for as this is the model it is pursuing. It wants to ensure that only those paying for Xbox Live Gold accounts can access its additional content services and even then there is usually a charge on top to get access to those." Talks between the BBC and Microsoft to create an Xbox Live iPlayer channel have so far made no progress, although that doesn't rule out the idea forever. Microsoft has made no secret of its aim to position the Xbox 360 as a home-entertainment hub, so we'd be surprised if someone didn't budge on one side or both in the next few weeks.